This is the latest firmware as of Dec 19th, 2015 for the WiFly Modem by Schema. This is the Hayes version meaning you will need to use AT commands to configure it. 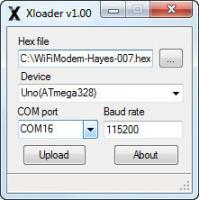 This I believe is the very first firmware ever publicly released for the WiFly Commodore modem. It isn't very useful and has bugs, but sometimes it's neat to see how a hardware project started out. This is the menu version that basically mean you can configure the device via menus instead of using Hayes AT commands. Can now escape to AT command mode after connecting to a host using +++. Guard time added to +++ (must wait 1 second before issuing +++). ATS2 command register for changing escape character. Default is ATS2=43 (+). ATM0-3 support. Does nothing but won't cause an error for BBSs that send in init string. X0 = 0-4 X1 = 0-5, 10+ X2 = 0-6, 10+ X3 = 0-5, 7, 10+ X4 = 0-7, 10+ 0 - OK 1 - CONNECT 2 - RING 3 - NO CARRIER 4 - ERROR 5 - CONNECT 1200 6 - NO DIALTONE (DNS failure) 7 - BUSY (Connection failure) 8 - NO ANSWER (not implemented) 10 - CONNECT 2400 11 - CONNECT 4800 . .
1200 baud support for inbound connections. ATH1 to take modem off-hook (WiFly goes to sleep) to prevent incoming connections. Default phone book entries when clearing have been removed. Can now abort waiting for inbound connection by pressing any key. Option to clear phone book. Improved character input routines in menus. WiFly Firmware v0.12 (Both Hayes & Menu Driven in archive) - Also included in archive is current User's Guide & Quick Start. -Fix for entering S2 register on command line that also includes * settings. Fix for connecting to Quantum Link. See documentation for new instructions. New AT*Bn option to hard code baud rate to 1200, 2400 or 9600. The manual has been updated to cover the new features. XLoader is a Windows utility for uploading a .hex file to the WiFly (basically flashing the WiFly with new firmware). It's super simple to use and works great!